Facebook admits as many as 14 millions of its users who thought they're sharing content privately with only friends may have inadvertently shared their posts with everyone because of a software bug. Facebook said in front of Congress in March over the Cambridge Analytica scandal that "every piece of content that you share on Facebook you own, you have complete control over who sees it and how you share it," but the news came out to be another failure of the company to keep the information of millions of users private. However, the social media giant revealed Thursday that it recently found a bug that automatically updated the default audience setting for 14 million users' Facebook posts to "Public," even if they had intended to share them just with their friends, or a smaller group of people only. 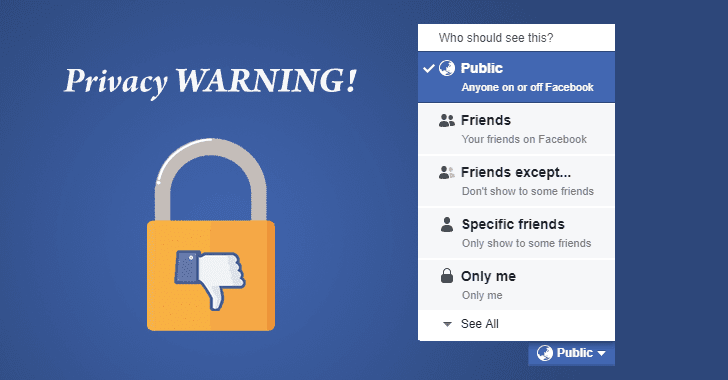 "We recently discovered a technical error between May 18 and 27 that automatically suggested a public audience when you were creating posts," Facebook's 'Please Review Your Posts' alert sent to affected users reads. "We apologize for this mistake." "We have fixed this issue and starting today we are letting everyone affected know and asking them to review any posts they made during that time," Egan said. "To be clear, this bug did not impact anything people had posted before—and they could still choose their audience just as they always have. We'd like to apologize for this mistake."